In a small saucepot combine 1/4 cup heavy cream and the white chocolate pieces. Cook over medium heat until the chocolate is completely melted. Remove from heat and cool completely.Beat remaining cream, confectioners’ sugar, and vanilla extract in small mixing bowl until stiff peaks form (do not overbeat). 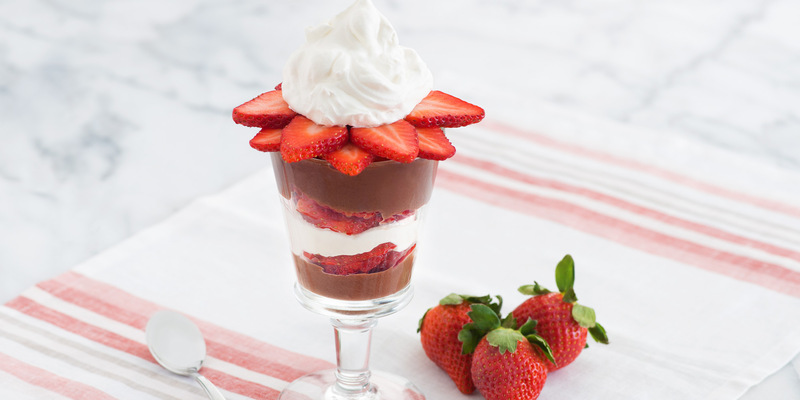 Fold melted baking bar mixture into whipped cream; refrigerate.Spoon into serving bowl or individual dishes. To assemble the dish layer the two mousses with the strawberries in four wide-rim glasses.Keep cold and garnish with fresh mint.